It handles links and notes with (automatic) timestamp-based IDs well. I should probably mention that I am the author and derived this from Dan Sheffler's MyWiki package. just in case anyone has downloaded it already, i made a little fix and also added automatic insertion of the note title upon note creation. 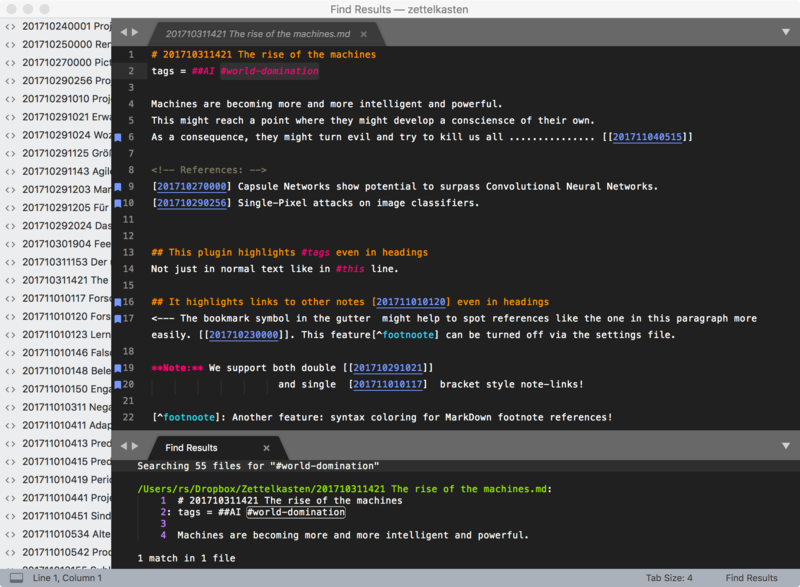 Sublime Text is one of my favourite alternatives to the archive. For the upcoming course on knowledge work there should be definitely a segment on how to make use of sublime. If your package fits in it gets a big shoutout. Sascha, that would be super awesome! 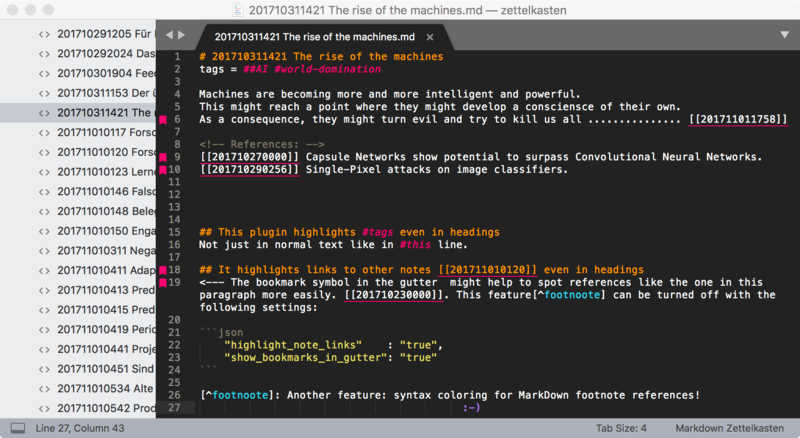 Working with my own tool, I realized I had introduced a stupid regression which causes new notes being created when following links. I have tested it now and it works again as intended. Sorry for the inconvenience. Sublime_ZK just became more awesome! It now supports multiple note archives via SublimeText projects! As a consequence, you don't even need to configure the location of your archive anymore. ... and if anyone is trying it, tell me what you think. We're approaching a stable release! Things got a bit simpler: no more dependencies on the Bracketeer plugin! New setting to automatically insert the note ID into the note's title, when creating a new note. I think, I've got it all covered now. I hope you don't mind my spamming. But so far, every time I thought it's finished, it didn't take long until I found something else that's missing. No, its fine. I'll rename the thread so it will be easier to identify: Your outpost for your sublime Zettelkasten. Thanks a lot @sfast and @ctietze!!! I hope I'll have the time soon to spam even more , describing how I use it for my (beginner-level, I guess it takes years to achieve "ZK Mastery") Zettelkasten work. I really enjoy it a lot, this Zettelkasten method. And my little plugin now feels like a major upgrade to SublimeText. 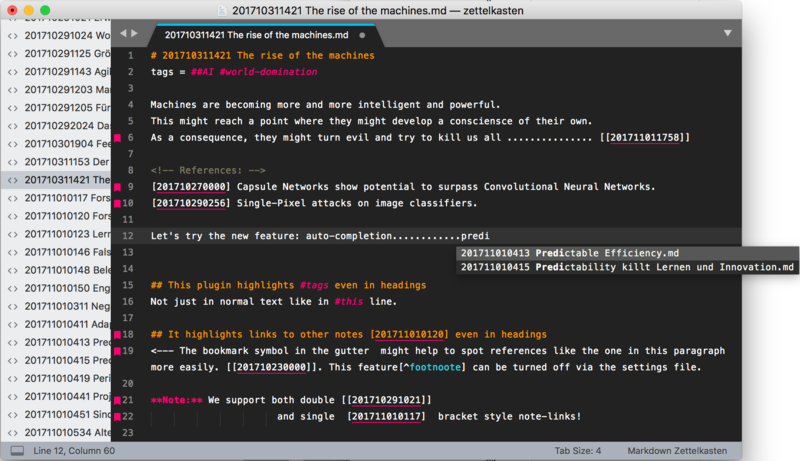 My editor has just gotten more useful - a lot! Non-sublime-specific: "Fragmented writing" really boosts my productivity. And knowing that every thought, every note, has a place now and can be retrieved when I need it, pointing me to further notes and thoughts, branching off into related thoughts and topics -- just makes it perfect! Had I only known this ... years ago. Why did nobody tell me??? Thinking of it, this is similar to how I worked when I was a (very curious) kid, exploring and researching stuff. I read and made notes about how I would describe it, I wrote paper notes about related topics and carried them around in a "folder" . I could always pull them out, flip through them, re-arrange them... In a way that was a very natural way of working with elaborated thoughts. I used my paper notes a lot to get back into the flow when I wanted to pick up something I had worked on, after a break, to go even deeper into the matter. And it was very easy to come up with really good texts about my "research". Can you please commit it to package control, since it's been bundled into Sublime Text as the official plugin manager? @rene Thanks for making this great plugin! You've done a good job. I like how it works. I opened some issues on your repository, and also some pull requests to help improve the plugin. Sublime has lots of nifty features that your plugin can take advantage of, for example the completions API to auto-fill zettel notes without leaving the flow of text entry! Check out my pull requests and I look forward to your thoughts! Woooha! What happened "over night"? Well, @toolboxen -- how awesome is that?!?!? Thanks a million for your most valuable contributions!!! I am not a SublimeText expert and you know some details I simply don't. Thank you for all the issues (very thought provoking and sensible) and your pull requests (which means you've provided source code I can merge - awesome!). I already merged your pull requests! Will look at the issues and check how to commit it directly to package control (thx @yee for the reminder!). thanks @rene but I know just enough stuff about sublime to be dangerous. but it's cool to have a package for sublime to develop into a useful foundation for zettel-related work. Time for an update... A lot has changed under the hood of this little plugin. Special thanks goes out to @toolboxen for all those good ideas and help :thumbs up: !!! Wow, a lot of progress in so short of time! good work! 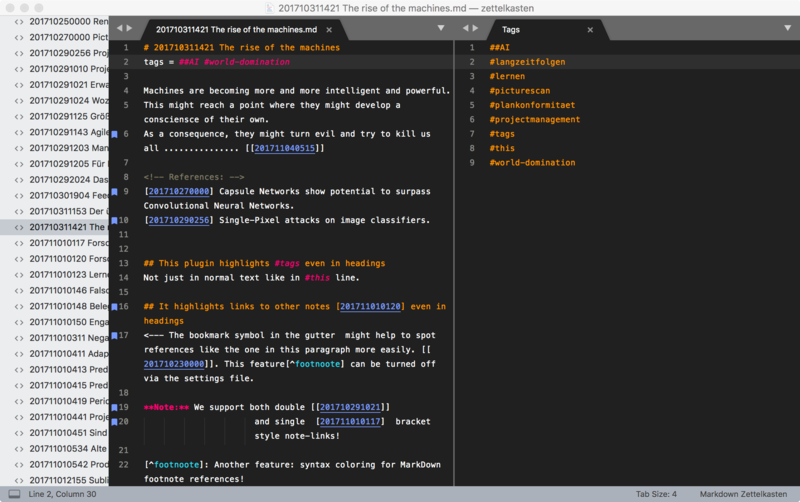 Aaaand now we're more in line with the usual way syntax coloring etc is handled in SublimeText. This makes it a tiny bit more involved to install/configure but it will be more flexible in the long run, avoiding potential conflicts / issues with other Markdown packages or color schemes, etc. @rene thanks for letting me assist improving the plugin. It works quite smoothly and I think it will help a lot of people! Your contributions are highly appreciated! Two minds are better than one! Thanks again to @toolboxen for his suggestions and hints. What use is a list of tags if you can't find your notes by tag? Thanks so much for making this remarkable package! I've been a user of Dan Sheffler's wikilink package for a while and this really extends that functionality in promising directions. The one issue I've been having is with the syntax underlining and gutter bookmarks for the links. I have the links set to the default double square brackets and the sublime search field acts properly in being initiated by my pressing two open brackets. It then inserts the file name and two closing brackets. The issue is that the link is not then underlined or bookmarked. If I make the link single brackets, however, by deleting one on each side, it underlines the link and puts a bookmark in the gutter as it should. All of my settings are default, so I assume this should not be the default behavior? I've uninstalled and reinstalled the package and still get the same result. I've also double-checked all of the user settings and everything seems fine. Finally, I did have it installed manually prior to it being available via package control (and prior to single-bracket links being an option) and the double-bracket syntax worked exactly as expected at that time. Do you by chance know what might be causing this? Either way, thank you so much again for your efforts! This has been so much fun to play with. @zverhope Thanks! Feedback is always appreciated! It then inserts the file name and two closing brackets. The issue is that the link is not then underlined or bookmarked. One thing that comes to mind is that the underlining and bookmarking only happens if the text between the brackets is a 12-digit number. The plugin is intended to work with notes following this ID convention. If you have arbitrary filenames not containing spaces (or where the 1st word makes them unique) they would work, too, in terms of inserting and following links but the "highlighting" via underlining and gutter symbol will not work. This is intentional, especially since we support single bracket links now, too. The plugin should stay away from ordinary texts in brackets or other markdown constructs that use square brackets. If I make the link single brackets, however, by deleting one on each side, it underlines the link and puts a bookmark in the gutter as it should. This I cannot explain. Maybe some other plugin is doing that? All of my settings are default, so I assume this should not be the default behavior? Correct, this is not the desired behavior! However, I cannot really explain it. 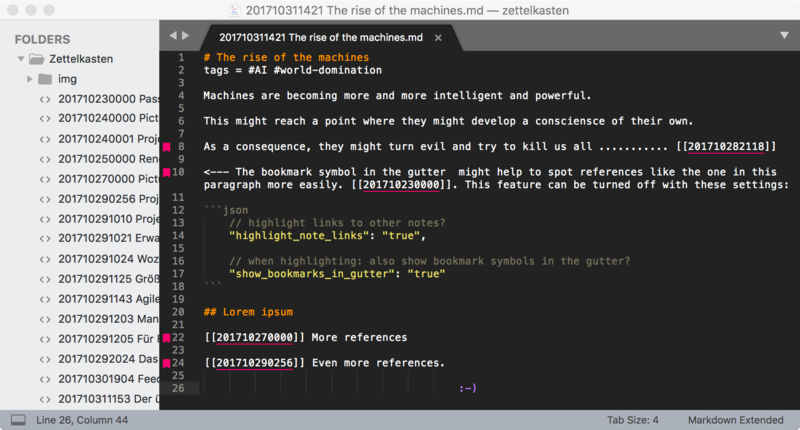 The setting regarding double brackets is only used when links are inserted by the plugin and has nothing to do with the highlighting (underline, gutter). I have notes, see the README screenshots that contain both [links] and [[links]]. They get highlighted correctly. Maybe it's possible that your manual install and your Package Control install are interfering with each other? Can you delete the manual install or move it outside of any SublimeText folder? If you provide more details (screenshot / test file / anything that helps) I should be able to help you better. Ah, and did you select Markdown Zettelkasten as syntax? That's sort of required now to get the syntax coloring right. @zverhope Some more info & background: I just checked. One of the changes I made recently was introducing the syntax file. 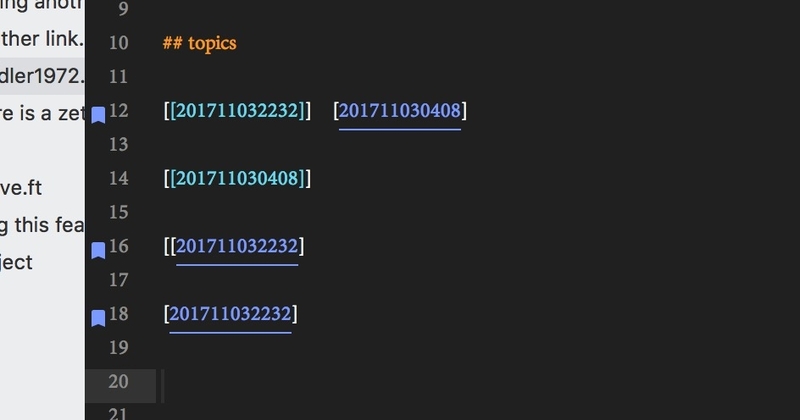 In older versions I 'manually' searched for [[ and ]] to find note-links. Now I do it differently: I let SublimeText mark up the text according to the syntax (coloring and assigning it a "scope"). Then in the plugin I ask SublimeText to return to me all the regions of text with that specific scope. 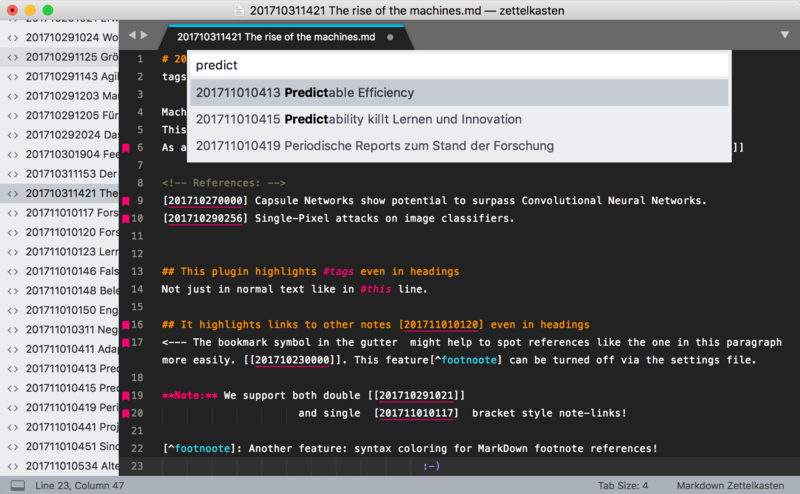 This has a few advantages, like users can now change the style and coloring of note links more easily, and theoretically it's also faster to let SublimeText do more of the work (plugin code is bound to be slower). 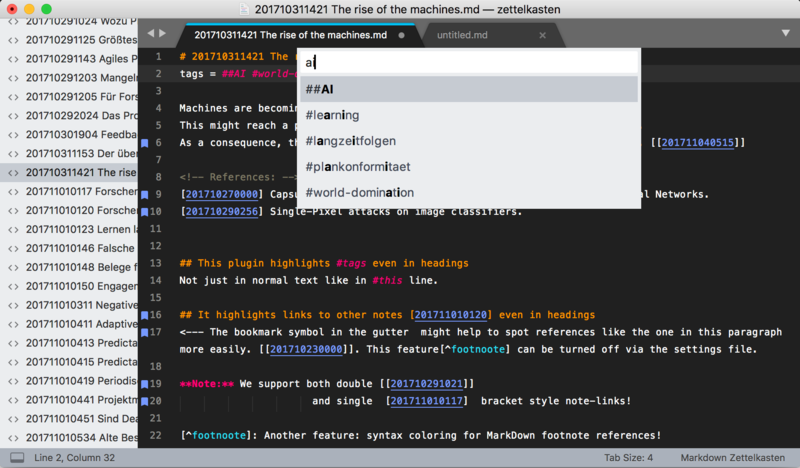 But it also means, underlining and gutter symbol will only work if the MardownZettelkasten syntax is selected. 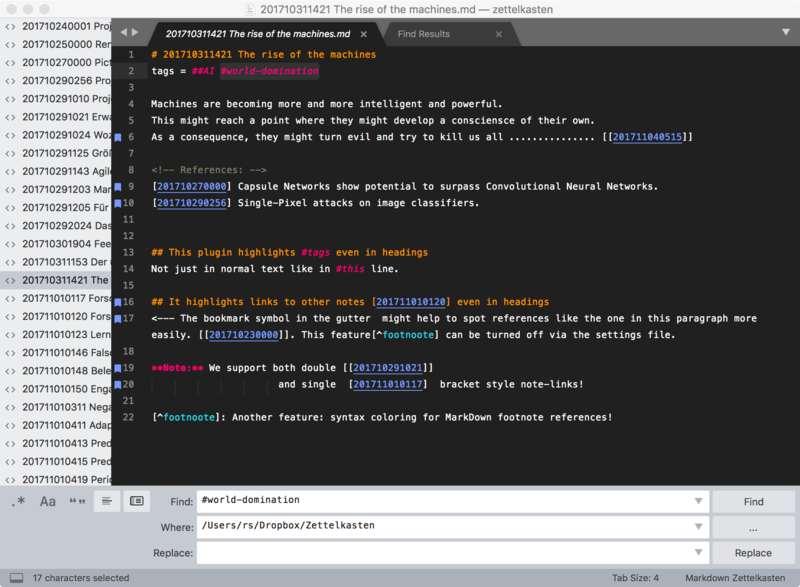 You can see & change the active syntax in the bottom right of the SublimeText window. So, I'm a bit puzzled. It's possible that another package is conflicting with yours, but I can't imagine where that conflict might be occurring. And as the double brackets were working properly on the manually installed version of your package, it's strange to me why it's stopped working since. It is, however, almost certainly a problem on my end (as it seems to work properly on yours), so it may not be possible for you to guide me to its correction. I really do appreciate all of your help though, as well as the time and effort you've put into this for all of our benefits. My additions are (obviously) one outer and inner square bracket, which I escaped appropriately. 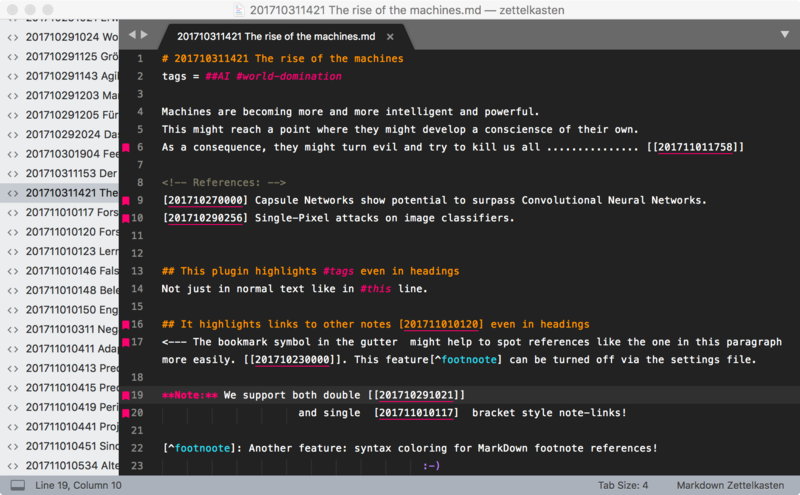 The syntax is now adding brackets and bookmarks as expected. I'm uncertain if I've simply altered the portion meant to apply to the double bracket being set to false, but it's no matter if so, as I don't need that option available. @zverhope thx for the clarifications... when I made "major" modifications to the plugins, sometimes it was useful to restart SublimeText but I guess that won't help you. Seeing your screenshot, I more and more think that something else is messing with your [[ double ]] brackets. Especially when closing with a single bracket you can see that whatever is interfering does not get triggered. This might be a syntax file you are using (I vaguely remember that in the early days of the plugin I had issues with MarkdownEditing), which overrides terms in brackets that themselves are enclosed in brackets. See the different coloring inside the first pair of brackets. The reason why it used to work before is because at that time my plugin did not care about syntax, it just looked out for note-ids in brackets applied a scope, underlining, etc to them. This has changed slightly now. Now it relies that the note-ids are correctly identified by SublimeText itself. You can use Tools->Developer->Show scope name (make sure the cursor is inside the note-ID) to verify that you get different scopes for single and double brackets. The underlined ones contain markup.zettel.link and the other ones very likely don't. But they should. Because, as per syntax file any [ followed by a 12-digit number and a ] should be marked as markup.zettel.link. So single or double shouldn't make a difference.